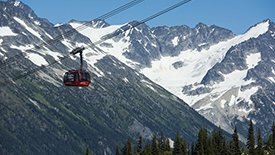 Tucked away in the coastal mountains between the picturesque slopes of Blackcomb and Whistler lies one of North America’s favourite resort hideaways, Whistler. 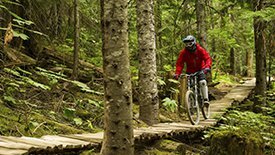 Known internationally as the continent’s premiere ski resort, the locals know that no matter the season, Whistler beckons with adventure. Summer visitors are rewarded with fishing, miles of mountain bike trails, thrilling river rafting, championship golfing, and ATV touring. Visiting when it’s cold outside? A magical winter wonderland awaits. Aside from acres of fresh powder to ski and snowboard, there’s cross-country skiing, snowmobiling, snowshoeing, heli-skiing and legendary après sessions. 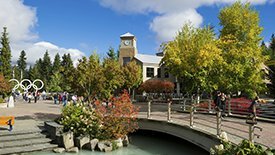 The charming, pedestrian-only alpine village is brimming with superb hotels, award-winning restaurants, rejuvenating spas, and boutique shopping. Voted one of the Top 10 Drives in the World, driving up to Whistler on the Sea to Sky highway adds to the thrill. Fly by helicopter or float plane to experience the breathtaking beauty from above.